Not so long ago, I had a wonderful chance to attend a financial management seminar sponsored by our university cooperative. Little did I know that I would learn more in the process. Our great speaker emphasize on financial freedom. This is one goal that all of us in the room would want to achieve. I am sure, it is your goal too. Since I don’t have any gifts to give you my dear readers this Christmas, perhaps a gift of knowledge would suffice. I do hope that you would get inspired by this little post in order to improve your cash flow and slowly setting up your finances towards your own financial freedom too. Let me begin. Cash flow refers to the movement of your money. In this particular post, we would be concerned with the flow of money to you. The more money you generate, the better is your financial status. That is why during our financial management seminar we were introduced with the Cash Flow Quadrant. 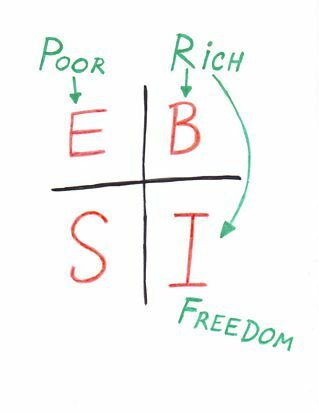 This quadrant is suggested by Robert Kiyosaki. Remember, Rich Dad Poor Dad author? The Cash Flow Quadrant suggests four ways to produce income. In here we have, Employee, Self-Employed, Business Owner and Investor. Employee. Most of us fit in this quadrant. Most of us are employed in a business or company. As for my case, I am employed in a local university here. In this quadrant, we have money every 15th or 30th of the money. This depends on your company’s payroll schedule. Needless to say, this is one secured quadrant since you would be expecting income regularly. However, having this alone will not guarantee financial freedom. Even more, your time is not for you to decide. The company dictates your time and just how much you would be earning. Hence, this quadrant is somewhat restricted. Self-employed. This quadrant talks about you owning a job. In here, you would probably have a business that you run for yourself. You might have a hobby in which you are earning. In my case, since I love baking, I take orders from family and friends. My parents have their own construction business. The money you generated would be dependent on the kind of business that you put up. As for my baking hobby, it is not that much. As for my parents, the money they generated is dependent on the project. But what differentiates self-employed to the third business quadrant is that it is you who runs it. This means, you will not earn if you are not there. I won’t be earning from my baking if I don’t bake it myself. My parents on the other hand would not be earning too if my parents would not be on site taking charge. Business owner. This quadrant is more flexible than the second quadrant. In here, you own a system and people works for you. Even if you are not in your business place, it would still be generating income. A good example would be major fastfood, shopping malls and more. There’s no need for the Ayala’s to be in their mall just for it to generate money. However, a system is established already that their employees will just have to follow. If I were to take my baking business to this level, this would mean I have hired myself bakers already to do the baking for me and a number of individuals to do the marketing and delivery. I might already have a store too somewhere in the city. I will just be there to check. Oh how lovely this would be! Investor. In this last quadrant, you become an investor. In here, the money works for you. To date, there are already a great number of investments you can pursue. You can invest your money in the bank, time deposits, mutual funds, stocks and more. In this quadrant you simply wait for your money to generate income on your end. This is where most of the rich people invest in. it is no wonder that they have more time for themselves and their families whilst earning big time. Robert Kiyosaki and our financial management speaker stressed that in order to experience financial freedom, we must move to the other parts of the quadrant. Being employed is not enough. We must find ways in order to improve our cash flow by being self-employed, owning a business and via investments. Rich people tend to focus on the third and fourth quadrant. Hence, as the New Year approaches, perhaps it would be best to find opportunities in the third and fourth quadrant. I am slowly moving in the fourth quadrant. My helper is THIS! I hope you and I will achieve financial freedom together.